Recently I’ve been cutting back on my meat consumption for welfare reasons – mine and the animals concerned. I’ve managed to put together some vegetarian and pescetarian alternatives that in some cases have genuinely been preferable to meat based dishes. Annoyingly I haven’t documented them. 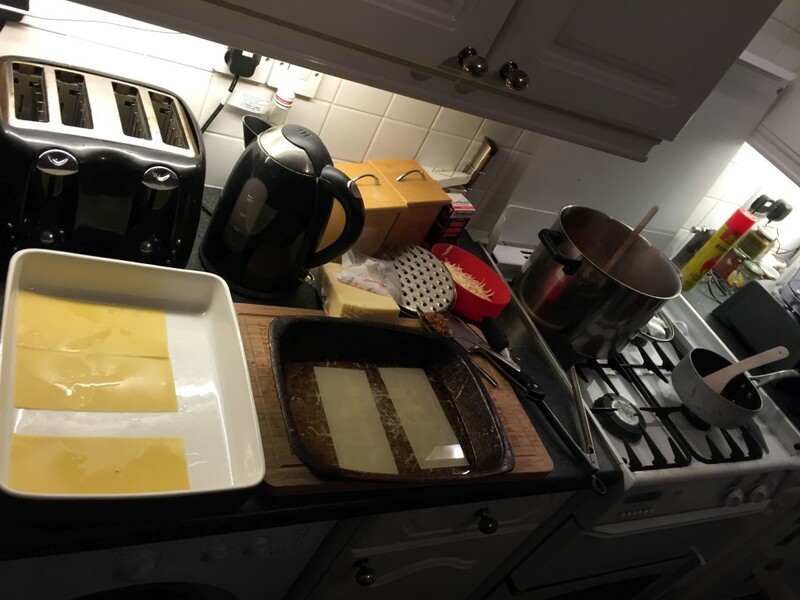 This evening I made a vegetarian lasagne which I would say is on par with the usual beef and pork version, so I’m documenting the recipe for future use. 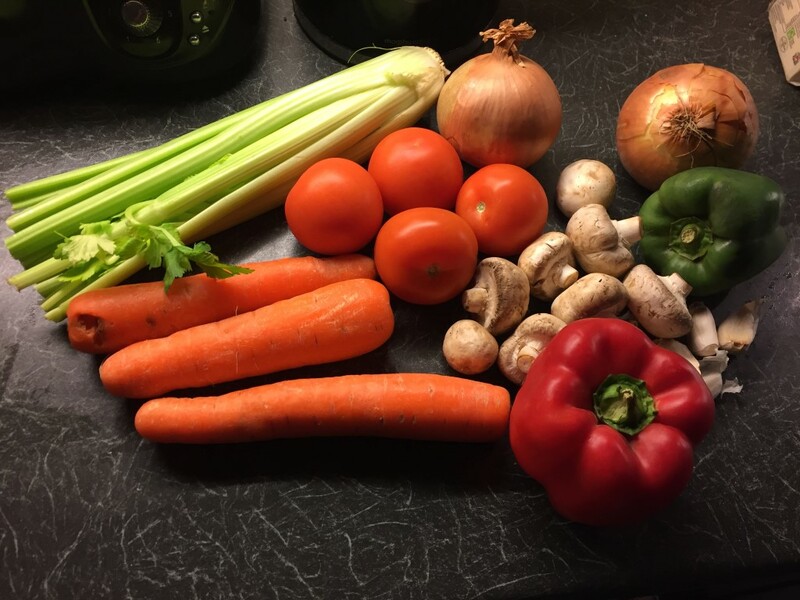 I started with some fruit and veg: celery, carrots, red and green peppers, onions, garlic, mushrooms and tomatoes. 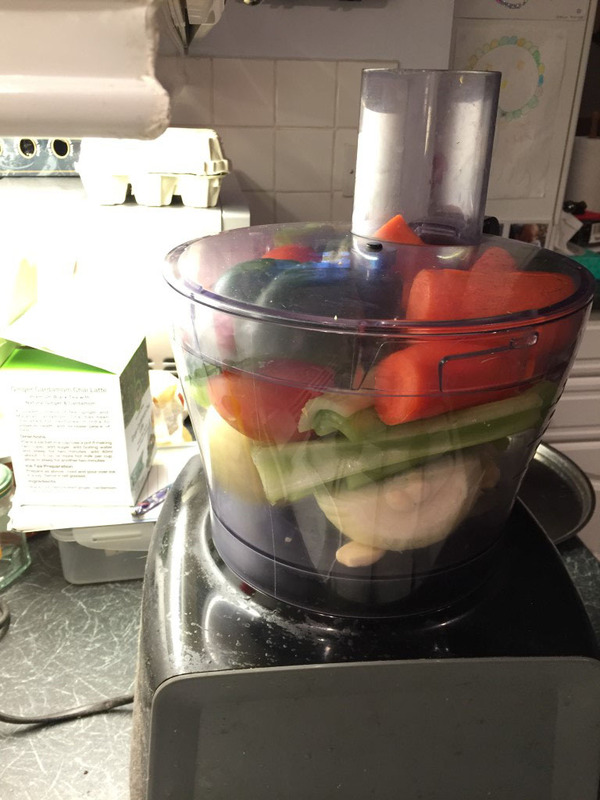 I peeled and trimmed the green pepper, garlic, onion, celery and carrots and popped that lot along with the tomatoes into the blender. 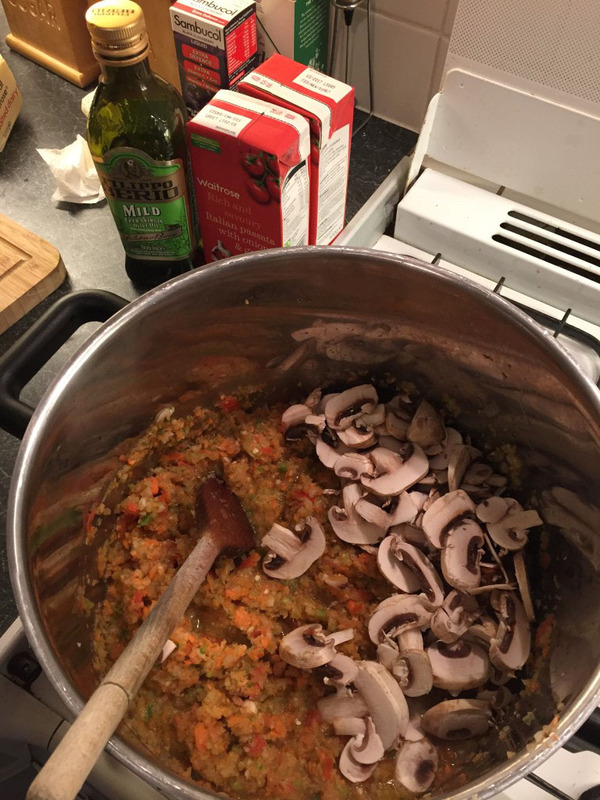 Mash that up, chop the mushrooms and pop into a big pot with a load of olive oil. Then the Quorn. Yes, Quorn. 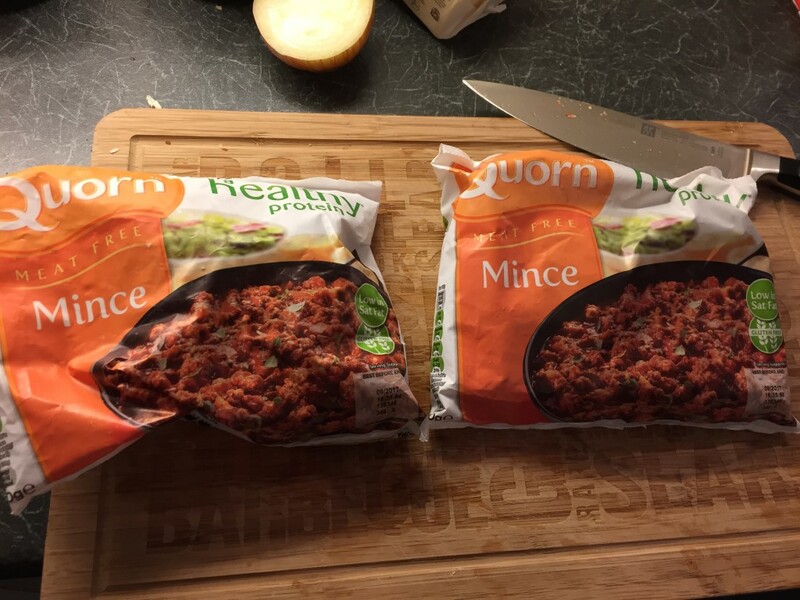 Some Quorn stuff is pretty vile in my opinion, but the “meat free mince” is actually pretty good. 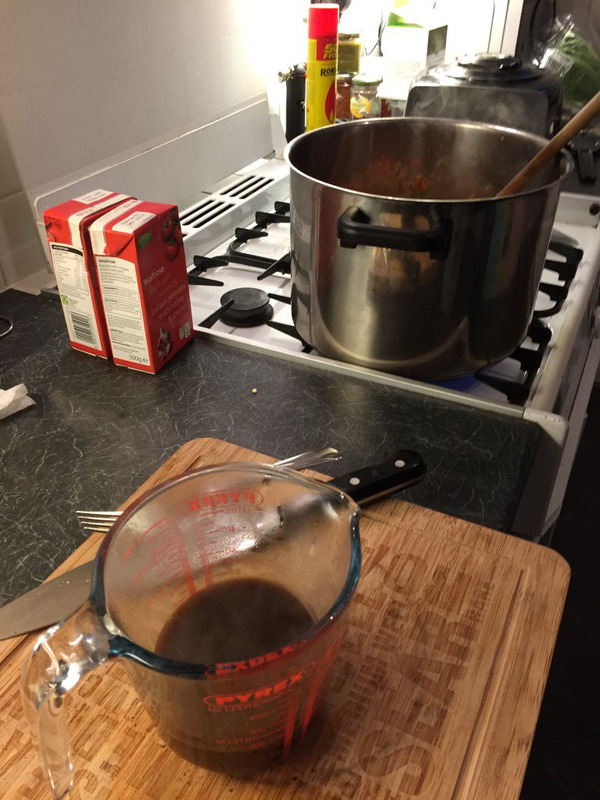 I find I need to add more oil than when cooking with meat, and I do cheat by adding a little beef stock from Oxo cubes, but of course you could replace that with vegetable stock if you’re more strict about that sort of thing. Fry all that in the pot too. Add the red pepper, chopped. 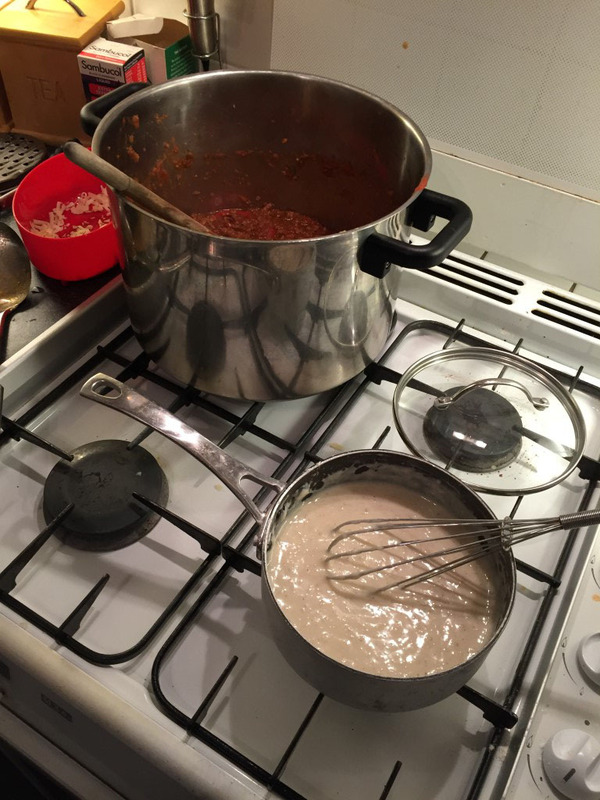 Then add the beef (or vegetable) stock, and finally the passata. 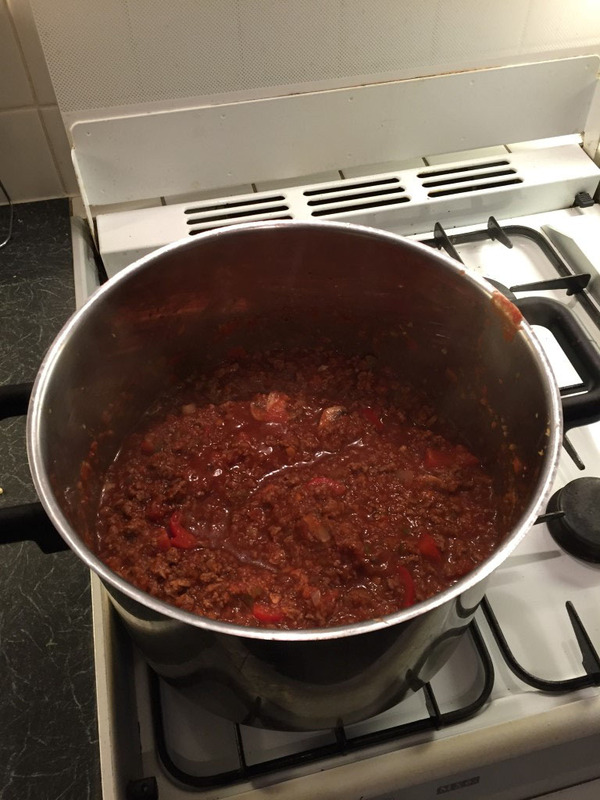 I’ve used 600g of mince, 2 stock cubes and a kilogram of passata. 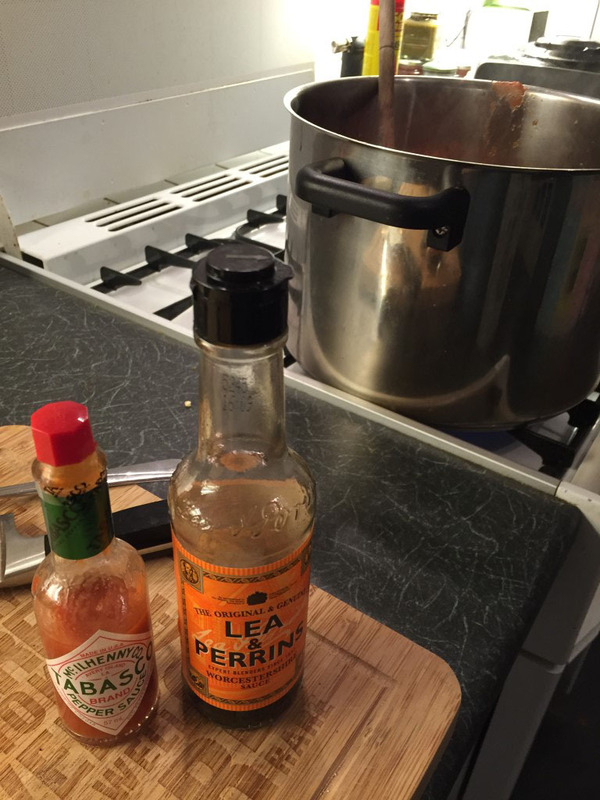 Add some Worcestershire sauce, ketchup, sugar, salt, pepper and tabasco until it tastes really very interesting. That’ll be the (meat free) ragù sorted. Leave it simmering on the hob. Next, blanch the lasagne sheets. You probably want enough for three layers. Now to make the cheese sauce. 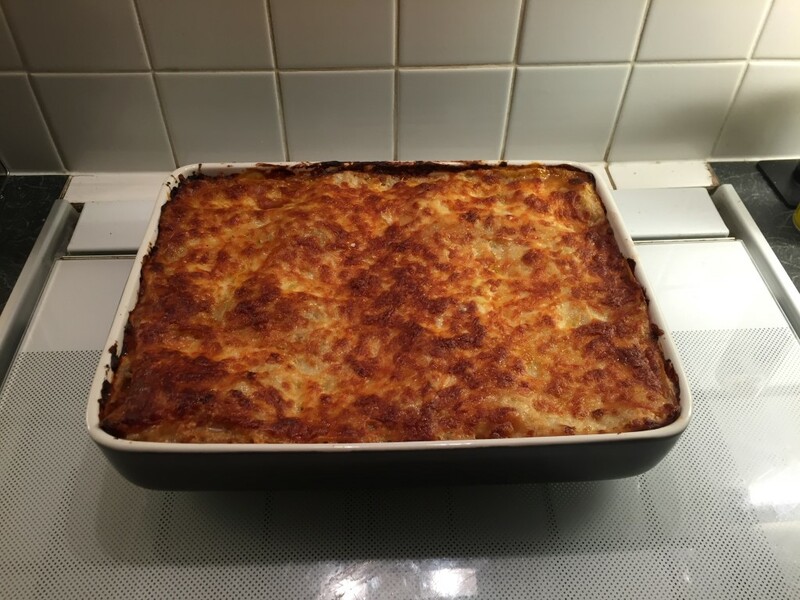 For this you’ll need butter, milk, nutmeg, plain white flour and grated mature cheddar. 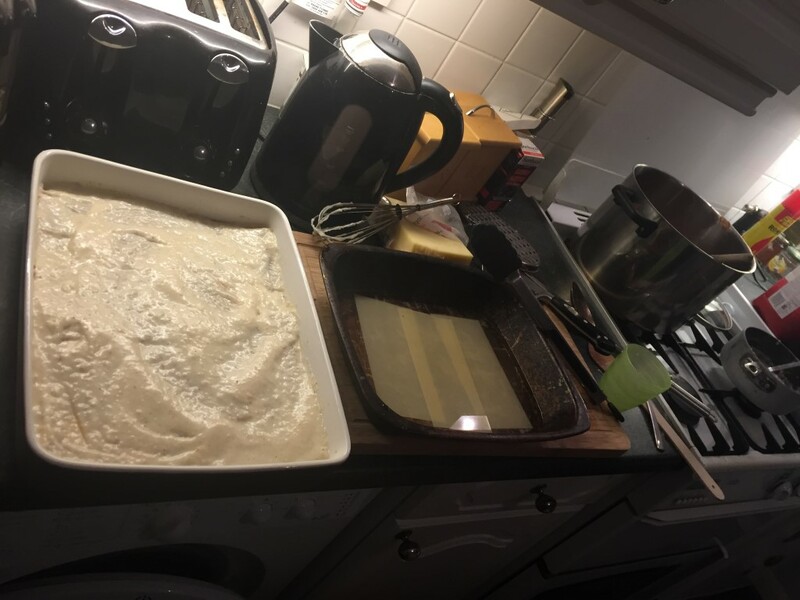 Start by melting the butter with the milk and nutmeg on the hob, then very slowly adding the flour while whisking continually. 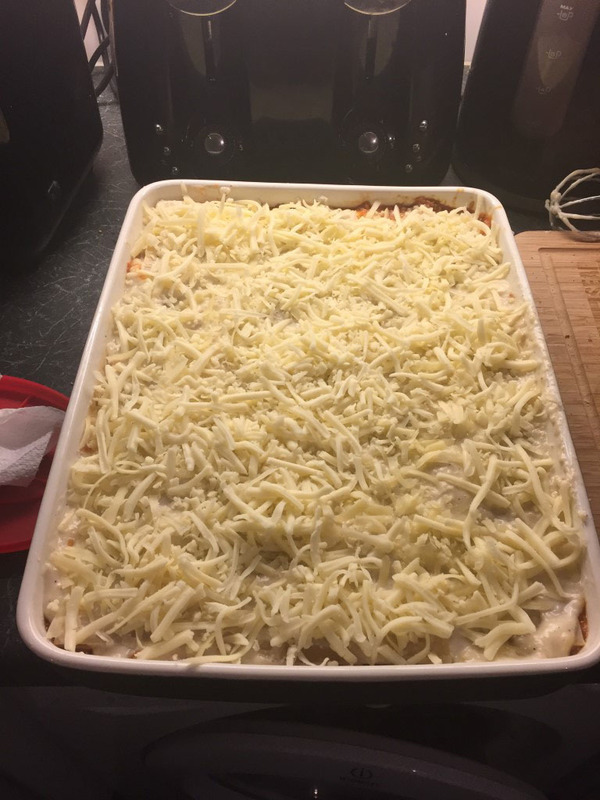 Once it starts to thicken, start adding the grated cheese until you get a nice thick consistency. Once you’ve got that, add the ragù, layer with lasagne sheets, white sauce, and repeat. On the top layer of white sauce, sprinkle some grated cheese. I used cheddar and mozzarella. Bake that for about 40 mins on mark 5. 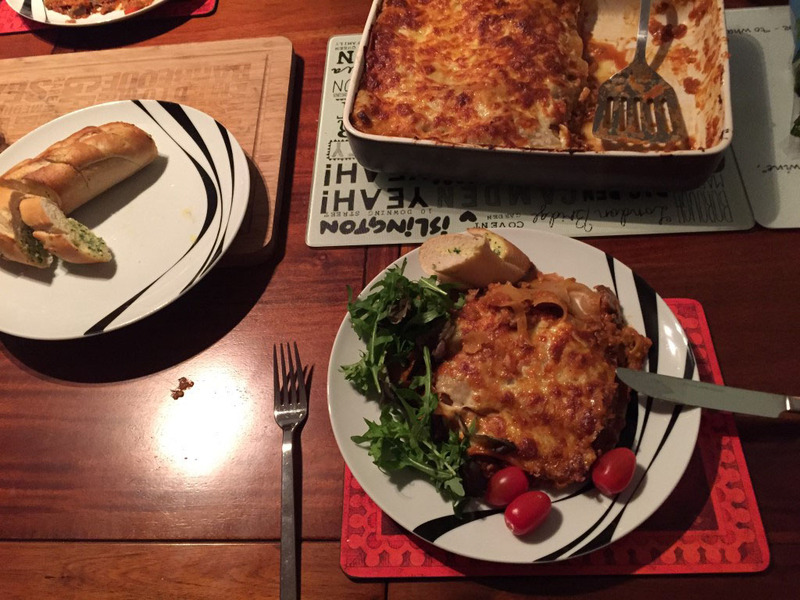 I served it up with garlic bread, salad and wine. Tasty!